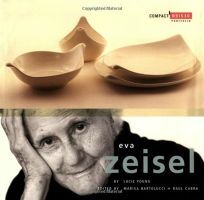 Part of Chronicle's Compact Design Portfolio series, this small-format illustrated volume showcases the graceful, curvy Modernist ceramic pieces of Hungarian-born industrial designer Eva Zeisel (previous books in the series have highlighted the work of designers including Michael Graves, Richard Sapper and Eileen Gray). With a career spanning several continents and nearly eight decades, Ziesel has racked up honors--a solo show at MoMA, for example (the museum has 75 of her pieces in its permanent collection), a Schramberg street named for her--and survived harrowing experiences (accused of plotting to kill Stalin, she spent 16 months Russian prisons). From sweetly humble 1926 handmade""crinkle planters"" to the popular 1946""Town and Country"" salt and pepper shakers, reminiscent of softened Brancusi sculptures--or Schmoo--to the lovely""Eva"" pitcher sets she made in 2002 for a Brooklyn design team, Zeisel's ceramics are pleasing, warmly minimalist, often""zoomorphic"" forms. She identifies her mission as""the playful search for beauty,"" and believes that""one has to learn not to take oneself too seriously, not to overly respect one's designs,"" since for every choice made,""there are always many more possibilities."" A true and endlessly energetic artist, Zeisel is as interesting as her designs, and Young's snappy, economical essay disappoints only in that one wishes it were longer, since there is obviously so much more to be said about Zeisel's life and art.